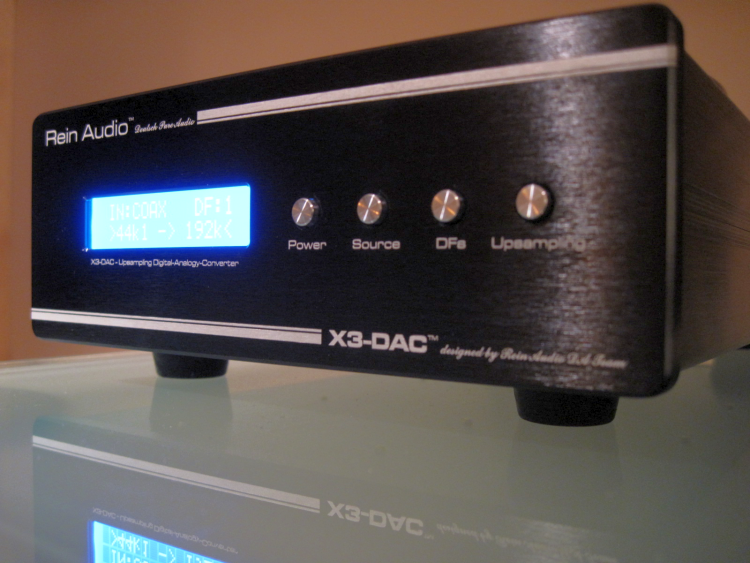 The X3 is the successor to the X-DAC that I reviewed early 2012. The X3 is a much improved unit: not only cosmetically, but also soundwise this is clearly the better version. 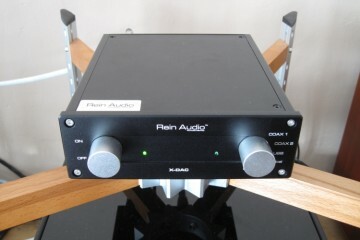 Review sample kindly supplied directly by manufacturer reinaudio. 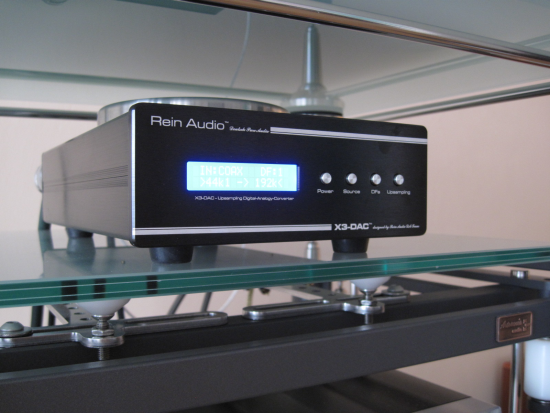 The original X-DAC was a simpler DAC, priced very attractively at 580 euro. The new X-3 under review here has had quite a price bump and the big question is of course: is it worth the extra outlay? Well, I can answer that question rightaway: yes, it is definitely worth it. Quite simply every aspect of the DAC has been improved upon. Let’s start with cosmetics. Where the old DAC only had two mechanical knobs, the X3 has neat electronic switches. The old DAC had no display but the X3 has a nice little informative LCD display. The photos don’t really do it justice as it would appear that text is not visible from an angle but in real life the readability is just fine. Looking at the back side, the differences are also obvious with the introduction of very high quality WBT-style connectors that look to be rhodium plated. 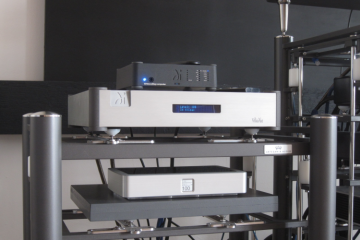 The X3 can work with any samplerate up to 24bits 192khz on all its inputs. The X3 offers switchable upsampling tp 192khz. While switching it off provides a slightly more grounded sound with more focus, the sound with upsampling provides a more airy and fluid presentation which I repeatedly preferred. Mind you, the sound of the X3 with upsampling is still very solid and focussed. This is a very positive sounding DAC. The switchable digital filters might be nice for some but I consistently preferred Df1 which I presume is the default filter. The others made for varying degrees of softening of the overall sound, mostly audible in the top treble and articulation of the bass. First I tried the X3 placed on top of the Artesania Exoteryc rack with a Furutech Alpha 3 powercord and Transparent Ultra XLR interlinks. Before listening started, the DAC had been running with a CD player on repeat for various days and since the DAC had been used before, I have no doubt when I began my tests that I was listening to a fully run-in unit. Various CD players were used as a source and so it became clear that the X3 isn’t very fussy about transports. While there were clear differences in sound, all the players I used worked well. The Meridian 506.24, feeding the X3 coaxially, sounded a lot more open and focussed, with faster, tidier bass and airier treble. On its own the 506.24 sounds fuller, with fatter bass and an arguably friendlier character but it is also hazier and less acoustically right. The Philips CD880 (CDM-1) in combination with the X3 sounds a lot more airy and refined than the Meridian and provides a larger soundstage but also sounds a devoid of colour, with less “meat on the bones”. The best match was found to be with the Levinson no.390S CD player, which provided more or less the advantages of the Philips and Meridian and added to that a more solid bass and a fuller midrange. It’s interesting to note that the 390S normally doesn’t work very well as a transport. 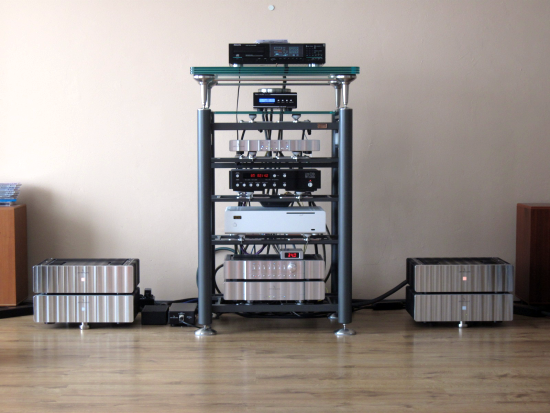 Thus far the only DAC that combined well has been the Rowland Aeris. Well, we can add the Rein X3 to the list. Perhaps it is just less fussy about jitter. Or there might be another mechanism at work, who knows. At this stage my opinion of the X3 was that of a lean, open, tidy and neutral DAC with very good detail and focus and just the right timbre. It is the opposite of synthetic and acoustically very convincing. But it was a little bit too strict, too dry and a little forward in the midrange. This is entirely different from what I remember the original XDAC to sound. The older DAC was smooth, warm and dark, almost too dark. I wondered how much further could I stretch the X3’s sound with proper care and setup. 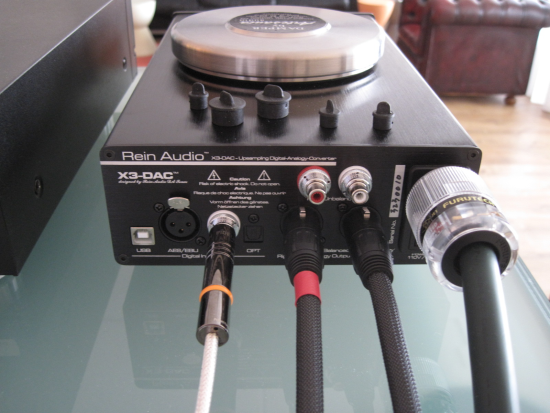 In order to bring some more warmth to the X3’s sound, I first swapped the Furutech Alpha 3 for a Lapp power cable. That helped a lot: gone was the apparent midrange forwardness. Then I changed the Transparent Ultra XLR cables for Cardas Hexlink Golden 5C XLR cables. Again the sound was moved in the right direction: beefier bass and a richer midrange. We lost some treble air along the way, but the X3 is open enough and overall sounds more balanced this way. Finally I relocated the DAC from the Artesania’s turntable platter to its normal top level in the suspended section of the rack and added an Artesania weight on top, to dampen the enclosure. This brought the X3 to its ideal working point. Now the sound gelled, became more luxurious and sounded more complete: still coherent but without being too dry or too forward. A quick comparison with the Jeff Rowland Aeris DAC (totally unfair as it costs 10 times the X3’s price) revealed that indeed the extra cost of the Aeris was still justified, as evidenced by a more dynamic, more colourful, bigger sound with more refinement. Still, switching back to the Levinson-X3 combination didn’t hurt. Not bad. Not bad at all. The sound retained its acoustical credibility and still had excellent focus and solidity. In fact, the X3’s sound reminded me a lot of that of the PS Audio’s NuWave DAC. There’s not a trace of artifice and no colouration, just pure, clean sound. Interestingly, the Wireworld Silver Starlight III, which is my long standing favourite coaxial digital cable, turned out not to be the best match between the Levinson and the X3. The better match was with the High Fidelity Cables CT-1, which better complemented the X3’s inherent speed and coherence. The Wireworld by contrast made for a more relaxed sound but also took away some dynamics and focus and most of all there was now less PRAT. So, it would seem that the X3 prefers fast and neutral cables. With USB you just never know. The implementation is crucial: I’ve heard esoterically priced components with badly implemented USB inputs (Wadia S7i springs to mind) and entry level components with excellent USB inputs. The Rein Audio X3 falls in the latter category. Its Asynchronous USB implementation is obviously well done and the resultant sound is just as clean, open, and focussed as its coaxial input. The AAZ Ultra Flow music server combines really well with the X3, again reminding me of how it sounded when paired with the PS Audio PWD. The Rein X3 is a neat little DAC that packs a lot of punch. 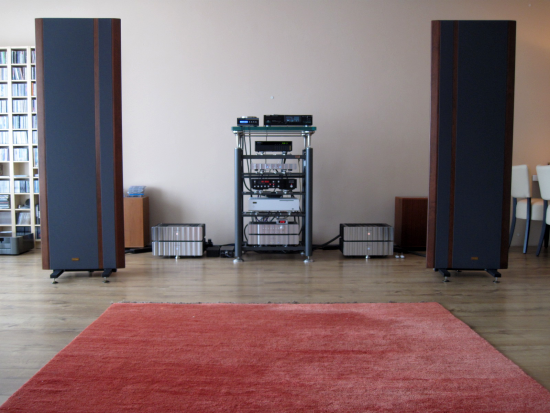 Its sound balance resembles that of the typical Naim sound: upbeat, well-timed, spot-on and well-focussed. It adds to that with very good resolution and a very natural, neutral timbre. There’s not a hint of artifice in its sound. Although I haven’t compared the X3 directly to the PS Audio NWD, from memory the two seem very close, which makes the X3 something of a bargain because the NWD was already extremely good at its price point, and the X3 comes in even cheaper. 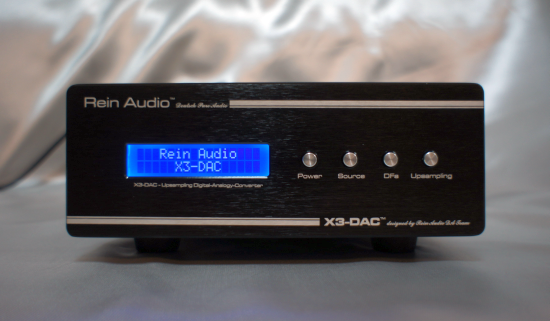 The X3 is not a smooth, romantic or mellow sounding DAC but neither is it analytical or anemic (sterile). It just threads the path of neutrality and it does so with verve.